Okay, time to get back into the swing of things here. Exams are finally finished, and I've moved into a new place! I'm starting to get settled, too, and get my kitchen in order - tons more counter/cooking space and room for more kitchen accessories! Huzzah! 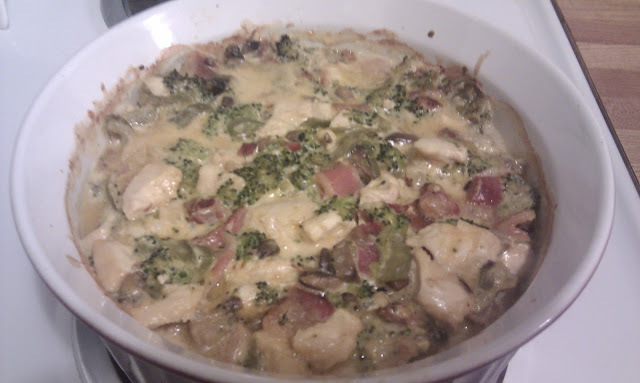 Following up from my last post, which I realize was a long time ago, I am posting another casserole dish. In particular, kitchen sink casserole. This is one of my favourites as it reminds me of hamburger helper. I love(d) that stuff! I never thought to make this, though, until my friend pointed me in the direction of this blog. There are tons of big meal recipes here that are intended to last a week. I love such recipes because they are great for a two-person household. Lunches and dinners! Yum! 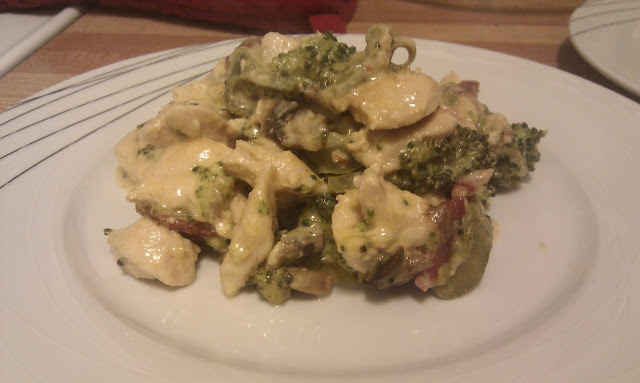 Try out the kitchen sink casserole recipe over at Caveman Keto if you want something jam-packed with stuff. My take is a little on the lighter side yet still satisfyingly filling. You can use just about any meats with this recipe - I've used chicken breast, chicken thighs, ground beef, cubed beef, cubed pork, extra bacon... Though not all at once. I imagine you could also try it with tuna (yum, tuna casserole). Since the main meat choice is totally up to you, the nutritional values here excludes any meat other than bacon. 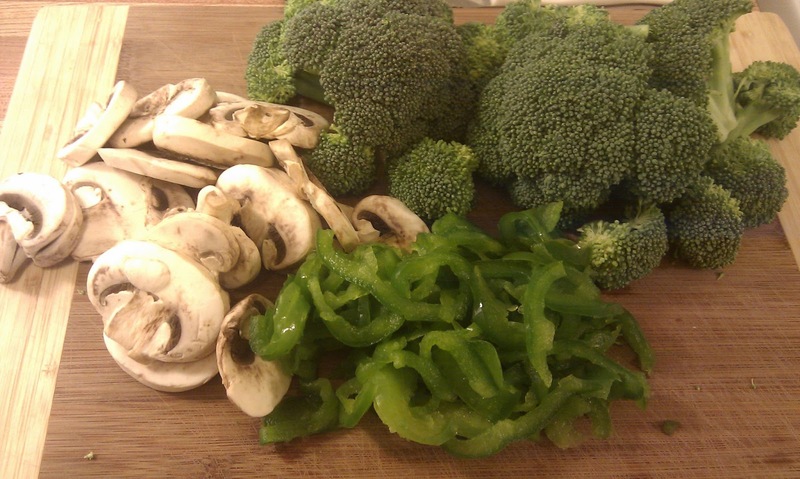 Sometimes I add other veggies into the mix, such as sliced green peppers, a bit of diced tomato, wax beans. Be creative! A tip from Caveman Keto, which I agree with: try to multitask and have multiple things cooking at the same time, so you're not doing a lot of waiting around. 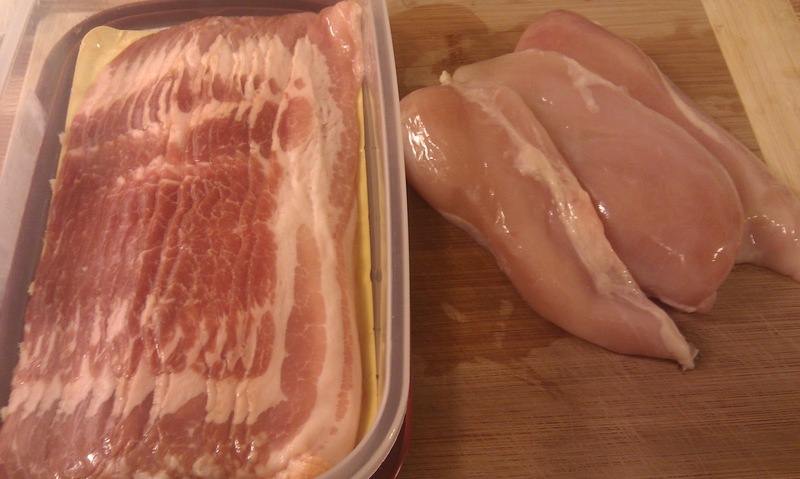 Cover your baking/cookie sheet in aluminum foil and lay your bacon strips out on it. 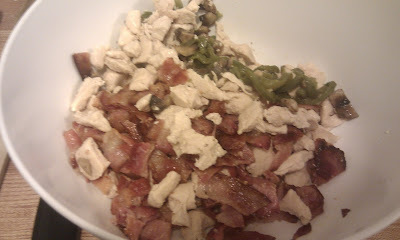 Pop it in the oven and turn up the heat to 350F (no need to preheat, the bacon will cook nicely as the oven heats up). Put the cream cheese in a bowl on top of the stove now (unless you took it out earlier to let it soften). Chop up your desired meat into whatever shapes/sizes you feel appropriate. I "cube" most of my meat into 1 inch or smaller. Toss these in a frying pan with some butter or oil and fry on medium. Cut/break your cauliflower (or broccoli) into florets or just chop it up into small pieces, roughly the same size or smaller than your meat. Using a microwaveable container, zap (or use a steamer!) your florets/pieces for 3-5 minutes. Zap a bit longer if the veggies are still hard. Chop your mushrooms as well. If you're using green pepper, I suggest slicing that relatively thinly so it cooks nicely. 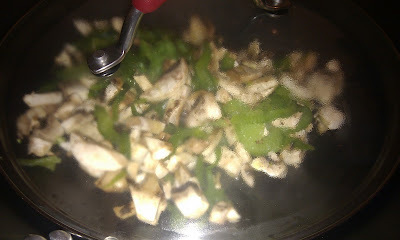 When the meat is just about cooked, toss all the chopped veggies (except the florets) into the same, or a different pan. Continue to fry the mixture over medium heat. Grate your cheddar cheese and set aside. If your oven has finished heating up, the bacon should be ready. If not, leave it in for a couple minutes (or until it is cooked the way you like it). I find that for such recipes, softer bacon is better. If it is finished, take it out of the oven (leave the oven on!) and transfer the slices to some paper towel to drain. Or don't drain them if you want all that grease. Your call. In any case, let the slices cool so you can handle them later. Once cool, chop/cut/rip the pieces into smallish bits. Your florets should also be just about ready. To check, stick your fork in one. If it goes in easily, and they are kind of soft, the florets are ready. Also check those frying veggies! Dump meats and veggies into a mixing bowl. 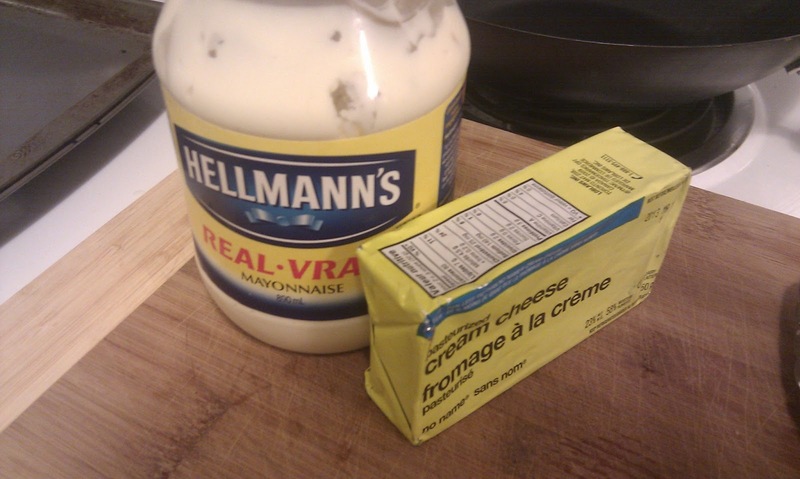 Add cheeses and mayo and stir. Feel free to add any spices you desire at this point. Transfer your mix into the baking pan and bake for 30 minutes at 350F. Then, for 5-10 minutes, broil the casserole. Remove casserole from the oven and let stand for 5-10 minutes before serving.